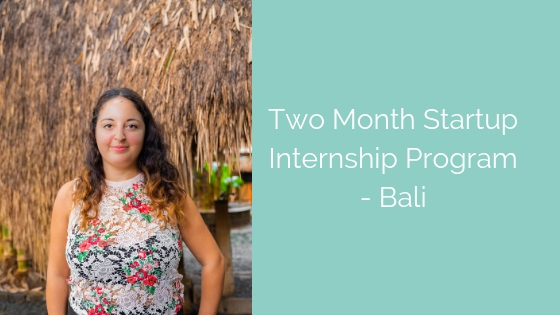 Isabella Ippolito spent two months on Start Me Up’s Startup Internship Program in Bali. During that time she got the chance to build her freelance portfolio and work on projects for Penguin Random House and on a viral campaign that was featured by the BBC – all while working from a co-working space by the beach. Why did you apply for the Start Me Up Program? I decide to apply for the Start Me Up program because I was looking for something different. I wanted to explore freelancing and the world of remote work to see if it was possible to get work experience and explore the world at the same time. I interned remotely for the British artist Helen Marshall founder of The People’s Picture. She creates giant photomosaics that have been featured in the BBC, The Telegraph, The Financial Times and The Guardian. I was responsible for creating motion graphics and videos for digital promotional campaigns. I was lucky to work for “The Face Of Suffrage” a project to celebrate the 100 years of women having the vote in the UK. I also worked with Penguin Random House to create a giant mosaic project for “The Snowman”. What kind of impact did you have? My promotional videos were used across the various social media to promote the campaign so it was an essential part of the project to engage the audience. I’m proud that I achieved exactly what I set out to do. I made the best of my time while I was in Bali, won new freelance clients developed a close relationship with my mentor. How did you find working in Bali for someone in London? It was challenging at first to move form a big city to a more relaxed environment but it was exactly what I needed. I had the opportunity to explore a new culture, see more of the world and learn new work-related skills. It was fantastic to be surrounded by amazing views and nature, to have great and fresh food and meet skilled people from all over the world. How do you think you grew during the internship? I am glad that I did the internship because it helped me decide which direction I wanted to take for my future career. So I definitely feel like I grew during my experience – not only in the professional side but also on the personal side.